BCDB Rating: 4.6/5 Stars from 9 users. This page has been viewed 103 times this month, and 10956 times total. Cartoon Characters: Littlefoot, Cera, Ducky, Petrie, Grandfather, Littlefoot's Mother, Rooter. Voice Actors: Gabriel Damon, Candace Hutson, Judith Barsi, Will Ryan, Bill Erwin, Helen Shaver. Written By Stu Krieger, Judy Freudberg, Tony Geiss. Music: James Horner, Will Jennings. Editor: John K. Carr, Dan Molina. Originally Released on November 18, 1988. You can watch this cartoon today on your computer. 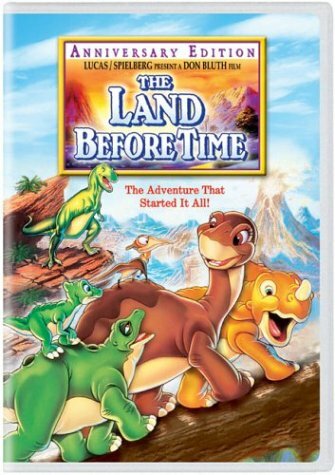 Just click below to start viewing "The Land Before Time" online now. Do you have anything to add to this page? Have we made any mistakes... or do you have any additional information about The Land Before Time? If so, we would love to hear from you. Please send us a quick note with your additions or corrections to this page, and we will make the corrections as soon as possible! Below are comments about this cartoon submitted by people who have seen this show. 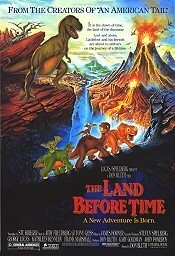 Take a look and see what others have said about The Land Before Time. We want to know what you think, too!! Feel free to share your own opinion- we do want to hear from you! You can add your own comments here. like the topic says unlike disney universal doesnt make movies to promote a toy line once in a while you will see a few minor toys at mcdonolds burger kings etc which promote the film. The Land Before Time by Big Cartoon DataBase is licensed under a Creative Commons Attribution-NonCommercial-ShareAlike 4.0 International License.